Pete Egoscue takes his world-renowned program of postural therapy--which treats chronic musculoskeletal pain without drugs, surgery, or manipulation--to a whole new level. Pete Egoscue explores the mental and emotional, as well as physiological, processes of his Method. Egoscue's unique system has transformed the well being of hundreds of thousands of people through personalized stretches and exercises that strengthen specific muscles, restore proper alignment, and leave the body feeling the way it was designed to be: pain free. 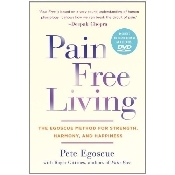 Pete Egoscue has established more than 25 clinics internationally, with corporate headquarters in San Diego, California--and The Egoscue Method® is the world leader in non-medical pain relief. He is the author of four books, including the best selling Pain Free and host of the talk radio show of the same name.